Covered by an ABC News affiliate out of Houston, a Texas family visited a Walmart in Sealy to purchase a third-generation Apple iPad only to find an unfortunate surprise inside the packaging. 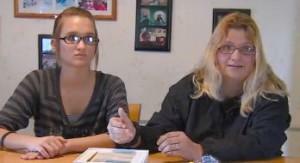 Bobbi Linden, mother of 15-year-old Courtney, had purchased the iPad for her daughter’s birthday. Upon returning home, they discovered the iPad had been replaced with a stack of yellow notepads stuffed into the packaging to replace the weight of a typical iPad. The family immediately returned to Walmart with the packaging and stack of notepad paper, but had to deal with a skeptical manager. Initially, store management claimed that it was impossible for this to have happened at Walmart since all iPads arrive sealed. Regarding being treated with skepticism, Linden described the manager’s position as “You know, she’s never seen this happen before. They come sealed, there’s no way this could have happened. She said that those note pads in that box were bought yesterday. I was crying and pleading with her, ‘Look, I didn’t do this.’ She was just saying she has never seen it happen before and she couldn’t help us.” Eventually, the family had to leave the store without being refunded the money from the original purchase. After several local news stations around Houston were contacted, Walmart’s investigation into the matter discovered that the iPad in question was originally purchased at another store location before being returned at the Sealy location. According to Walmart officials, an unnamed scam artist removed the iPad from the box, replaced the expensive tablet with a stack of yellow notepads and resealed the box with plastic that resembled the original factory packaging. Regarding the Linden’s experience, Gee stated “We never want our customers to have a bad experience and we want to focus on doing what is right for the customer. We are in the process of reaching out to Ms. Linden to offer her a full refund, a new iPad and an apology for the mix-up.” The family plans to take Walmart up on the offer of a free iPad, but are still disappointed in the way they were initially treated. Similar iPad scams have caught customers around North American off guard since the first iPad was released. During January 2012, several major retailers in Canada sold iPad 2 boxes containing modeling clay that was designed to simulate the same weight as the tablet. As many as 24 tablets were swapped out and returned at stores like Best Buy, Future Shop and Walmart. During late August 2011, a 22-year-old woman in South Carolina purchased a sealed Fedex box supposedly containing an iPad for a price of $180. After returning home, the young woman discovered the box contained a plank of wood that had been painted to resemble an iPad on display at Best Buy.